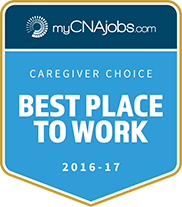 The Northwest Suburban Right At Home office has been recognized by myCNAjobs.com as a “Best Place to Work” by the caregivers we employ. This award demonstrates our commitment to hiring excellent caregivers and providing them with the ongoing training and support they need to succeed. "There is no better company to work for! The longer I work there, the more things I discover and like about the company. It is the first time that I have worked for a place that cares so much about their employees and provides support." Provides various personal care and related paraprofessional services in accordance with an established plan of care. Provides for the personal needs and comfort of clients in their homes. Provides for the personal needs and comfort of patients in their homes. Provides for the maintenance of a safe and clean environment. Performs various housekeeping tasks, meal preparation and companionship activities for clients in their residences. Caregiver stays overnight. A Home Health Aide provides various personal care and related paraprofessional services in accordance with an established plan of care. Provides for the personal needs and comfort of patients in their homes. This position has more qualifications than the Personal Care Assistant/Nurse Assistant.